If you like to prospect for gold in streams and rivers, then you probably already own a sluice box. These simple devices are a must-have item for most gold prospectors because they allow you to process so much more gravel than you would be able to do with just a gold pan alone. While most sluice boxes work by using the same basic principles of gravity separation, they are not all created equal when it comes to how much gold they are able to capture and hold. Different types of sluice boxes may work better or worse depending on the situation they are used in. 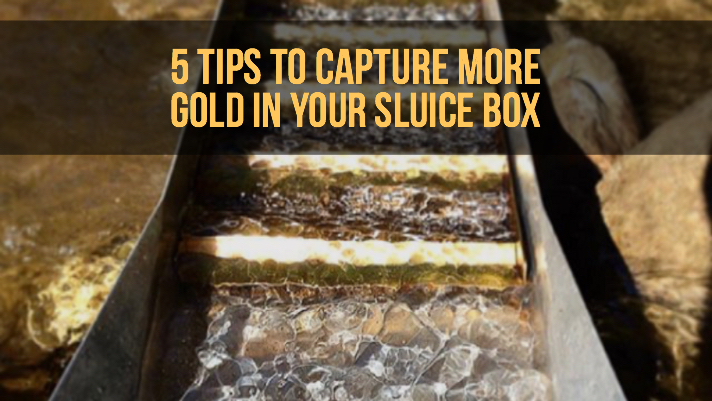 Regardless of the exact brand of sluice box that you are using, there are some basic principles that will help you increase the amount of gold you find. Let’s take a look at 5 things that may help you increase the amount of gold you find in a day of gold digging. Getting your sluice box setup correctly is absolutely critical for gold retention. This is especially true for holding that really fine textured gold which can easily be lost! Water that flows through the sluice box should be fast enough that it easily moves lighter materials (small rocks, gravel, sand, etc.) while allowing the gold to settle and hold in the riffles of the sluice. It needs to have good flow, but not so fast that you create whitewater conditions that create turbulence within the sluice box. If this happens, gold can easily be blown out the bottom of the sluice. Once the sluice is working with its ideal flow, don’t add material too quickly. Slowly add material to the head of the sluice and watch it to make sure that its moving through the box properly. Clays are a real challenge in many areas. Soils with high clay content will hold onto fine gold and prevent it from settling into the riffles of a sluice box. You have probably been around clay before that gets really sticky and slimy when wet. Gold particles will get trapped in that clay. If you are forced to deal with heavy clay soils you need to find a way to break up the clay. Heavy clods will tumble through the box just like a rock and any gold inside will bounce right through and be lost. So make sure you bust up and break apart heavy clays to allow for optimal gold recovery. Using a classifier to separate out the larger rocks and organic matter can help to increase your gold recovery also. Having large rocks tumbling through a sluice box can easily disrupt the turbulence of the water and eject gold that was nicely captured within the riffles. There is no doubt that classifying your gravel increases the amount of gold you yield from a certain amount of gravel, unfortunately it also takes a lot of time and energy. Some prospectors like to classify, while others simply shovel river gravels directly into the head of the sluice box. This will definitely have lower yields, BUT you will be able to process more gravel which may ultimately produce more gold for the time invested. Try both methods and see if classifying is worth doing in the area that you are mining. I generally find that cleaning out the concentrates from your sluice box once per day is sufficient, but this may not always be the case. If you notice that the riffles of the sluice box seem to be getting filled up you may need to do a cleanup throughout the day. Areas with heavy black sands may pack the riffles, which will obviously prevent gold from getting captured. Slightly increasing flow through your sluice may help, but don’t get to carried away at the expense of losing more gold due to turbulence in the sluice box. Matting material has come a long way in recent years. The old-timers often didn’t use matting at all. They might have just used some pieces of wood laying perpendicular to the water flow to create areas that gold would settle. Obviously we know now that some type of matting material will help to capture and hold gold. Some basic carpet can be used and works quite well at holding gold. You can also get specialized carpet material that is specially designed for sluices. Now there are types of miner's moss that most prospectors like to use, which is ideal for fine gold retention. Different types of matting can work better or worse depending on the size of gold you typically find, so experiment with what works best in your area. Every gold prospector should be conscious of the amount of gold that is being lost from their sluicing operation. 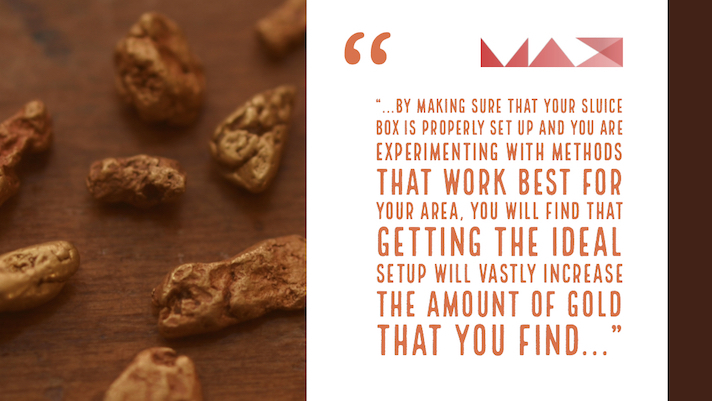 While there is no way to prevent all gold loss, by making sure that your sluice box is properly set up and you are experimenting with methods that work best for your area, you will find that getting the ideal setup will vastly increase the amount of gold that you find at the end of the day.